Are you a Professional Diver and Looking for most Reliable Watch which can sustain the pressure, temperature and other factors in the Deep Sea? 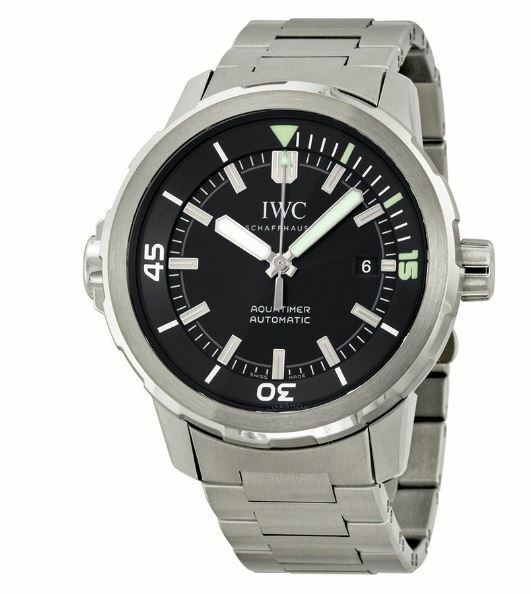 Then this IWC Aquatimer Review can help you find the Best watch for diving. No doubt, life under the sea is worth exploring but this adventure can prove to be fatal without proper training and precaution. and one of the foremost precautions is to equip yourself with the watch which can help you asses the time and depth of the dive, furthermore, helps you calculate your oxygen intake and time you can spend underwater before having to retreat to the surface. Keeping in mind the Factors and 50 Years of experience in the development and production of professional diver’s watches, IWC has come up with the finest watches Like Aquatimer Auto IW3290 Series. All of the Variants have almost the same features but with a slight change in design, Dial Color and an Option to choose a Bracelet or Rubber Strap. 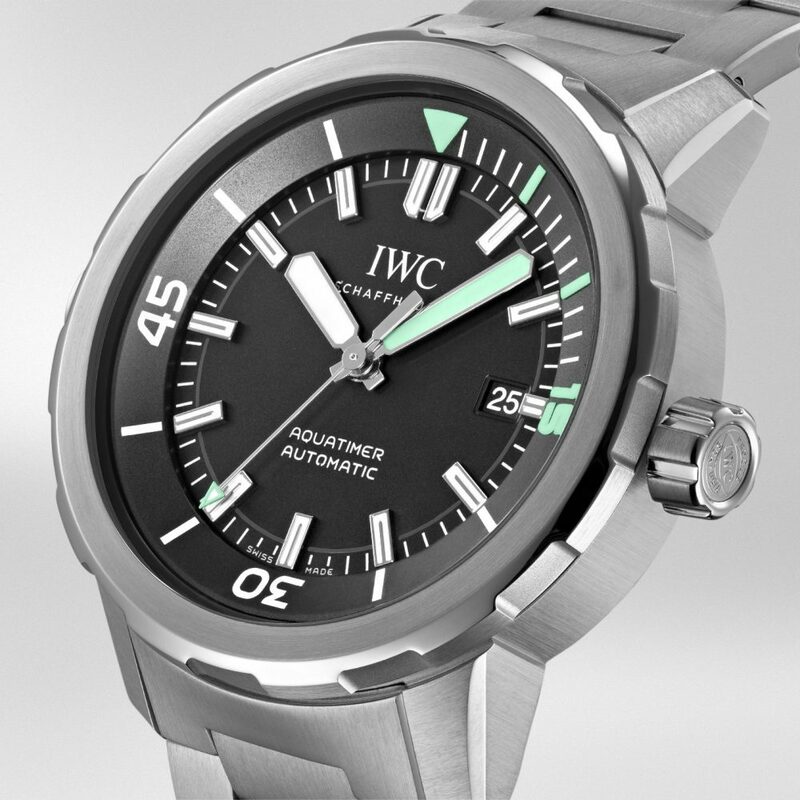 In this IWC Aquatimer Review, we are going to cover all the features offered in all variants. This IWC Aquatimer Auto 3290 Series doesn’t follow the path of other conventional Dive watches like Breitling SuperOcean or Rolex Submariner x in Design. With 16 cm in circumference, this watch is a sort of cross between a round watch and a cushion case and it wears beautifully for that reason. A little bit unconventional in architecture you will see the protruding cover of the differential system associated with the safe dive bezel and on the opposite side you’ll note that there are no crown guards as IWC believes the crown to be abundantly shielded by the height and thickness of the bezel. Like all other Aquatimer Watches, this Watch is also Equipped with “SafeDive” Mechanical External / Internal Rotating Bezel, which Is indeed the best Bezel Mechanism giving you an accurate and smooth Rotation. This flat Steel Outer Bezel gives a Men’s Dress Watch Look so Whether it’s a party, Meeting or Diving, this watch will suit you every time. This watch has Black Dial with luminous hands and hour markers, green accents on minute hand and outer rotating ring making it easy to read in low bright or No Light Condition. There’s a low-profile contrasting white date disc at three o’clock, which you might not need while diving but most of us are simply desk divers who enjoy the lure and the appeal of a high-performance machine on the wrist regardless of how deeply planned to dive. With the Height of 14 mm and 42 mm in diameter, No Sharp lug edges, vertical brushed sides and Nicely Polished chamfered edges this watch doesn’t look ugly, tall or bulky to wear so you can easily wear it under your loose sweater sleeves, sports jacket or diving suit. It has an IWC bracelet quick-change system so you can easily clean, resize or switch Between Rubber Strap or Stainless Steel Bracelet. If you love a bit heavy watch go for stainless steel bracelet else Rubber Strap can give you the ultimate lightweight experience. High-Quality Light Weight Rubber Strap has a width of 22mm and 7 holes, each made at an angle of 45 Degree to give us ease of wearing it. This strap is Odor Less and has a grove design from inside to enhance ventilation and grip so it won’t stink or Slip. Whereas the Buckle and Pin are made out of Stainless Steel. Its Beautiful Polished Bracelet will nicely curve around your wrist to give a premium look even on smaller wrists. It can easily be cleaned even from deeper areas due to its design and satin finish. The clasp is of exceptional quality, it’s a single fold and very substantial despite its low profile it feels as though it’s built like a tank. It has a Convex Sapphire Glass with Anti-reflective coating on both sides which makes it crystal clear up to such extent that sometimes you feel like there is nothing in there. The Glass is slightly curved but the dial is easily readable from any angle. On Inside is the Automatic 30120 caliber it’s essentially an ETA of the highest grade modified by IWC. it is a 42-hour power reserve and is protected by 30 Bar water resistance. It also features hacking seconds such that when you unscrew the crown and pull the crown to its extremity, you stop the balance hold the seconds, now you can precisely synchronize to whatever you will, a quartz watch, an atomic clock or even a dive timer. This watch is loaded with features and in the hands quite literally feels like a load of high-quality metal precision machined stamped almost as though it were cut from a single ingot of steel. It feels like a bank vault for the wrists definitely inspires the kind of confidence you want on a pure utilitarian timepiece but with a rather versatile combination of black dial and white metal, it can certainly be worn in many different occasions. 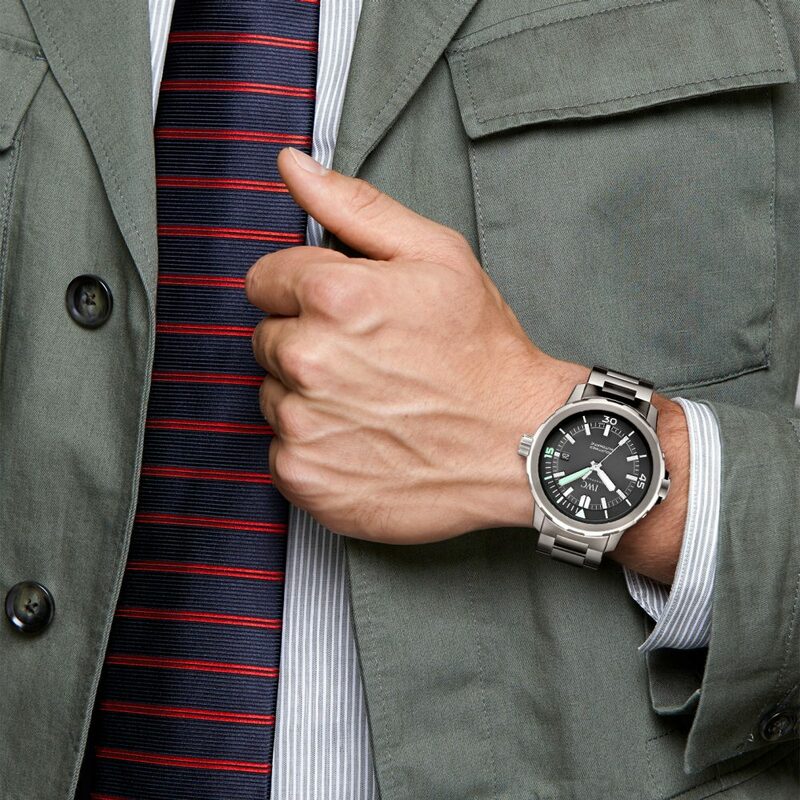 Hope you have loved reading IWC Aquatimer Review, and made up your mind buying it. If you have any questions or Queries, feel free to leave us a Comment.